Luxurious antique Indian rugs for sale at Esmaili Rugs & Antiques capture colorfully enchanting glimpses into India's rich past, when grand palaces housed regal royalty and powerful ruling dynasties such as the Ahom Kingdom, the Vijayanagara Empire and the Mewar Dynasty heavily influenced architecture and décor. Indian rug history begins when Babur arrived in India from Persia and was dismayed by a serious lack of luxuries in the country. His love for Persian rugs laid the foundation of rug-weaving traditions in India, which helped establish weaving centers in Lahore, Delhi and Agra. Inspired by Kashan, Esfahan and Kirman designs, these antique Indian rugs beautifully depicted Indian royal life, exquisite floral images and native animals in warm browns, reds and yellows. 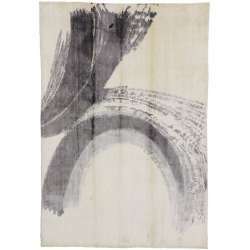 Silks and wools have always been essential materials in making knotted antique Indian rugs and carpets. Wool types depended on the region in which rugs were made, while silk knots were primarily found in the Kashmir area. Although the height of Indian carpet weaving existed during the Mughal Dynasty, British colonization in the 19th century revitalized the art of rug weaving. In addition to flower and animal scenes, antique Indian rugs crafted during this time displayed vividly compelling calligraphic and geometric patterns to complement spacious interiors of royal palaces and wealthy British homes. Muted color patterns and hints of classical Persian and Indian motifs catered to specific decorative preferences of the European elite. During India's famous Mughal art period in the 16th and 17th centuries, Agra represented the epicenter of carpet and rug making in India. Antique Agra rugs offer wonderfully eclectic backgrounds reflecting many classic achievements epitomizing Oriental rug weaving. Elegantly decorated with centralized patterns and vibrant medallions, Agra rugs included in our antique Indian rug collection online exhibit the intensely seductive palette indicative of Persian and Indian rugs complemented by muted, earthy shades and vibrant jewel-tones. During the 18th and 19th centuries, the East and Europe enjoyed good international relations. Commercial competition among the British East India Company and Danish, French, Portuguese and Indian companies increased considerably. Consequently, supply and demand within the rug industry shifted, leading to a decline in the Persian and Indian carpet market. Fortunately, this decline reversed in the middle 1800s, revived by wealthy American and English businessmen who rediscovered the timeless craftsmanship and beauty of these antique rugs. Adored and desired by rug enthusiasts all over the world, antique Mughal carpets represent the epitome of Mughal Empire artistry and weaving skills encouraged by Shah Jehan, the fourth Mughal emperor and builder of the stunning Taj Mahal. Created only for use by royalty, Mughal rugs beautifully capture the luxurious, breathtaking elegance of historical India. Located in the Dallas Design District, our antique rug gallery has convenient store hours (9am to 5pm) as well as access to our expert staff by phone: 214-651-7847. We also offer free estimates for rug cleaning, repairing and restoration projects and in-depth answers to questions about antique rugs and their histories.